Located only twelve miles north of Cardiff, Pontypridd serves as principal town for the Rhondda Cynon Taff region and is a must visit place if you are touring the Welsh valleys. In the past this part of Wales was often referred to as the Wild West due to its often turbulent and raucous past. ‘Ponty’ as the town is referred to by the locals is generally considered to be the gateway to the famous Welsh valleys and the history and heritage that they call their own. 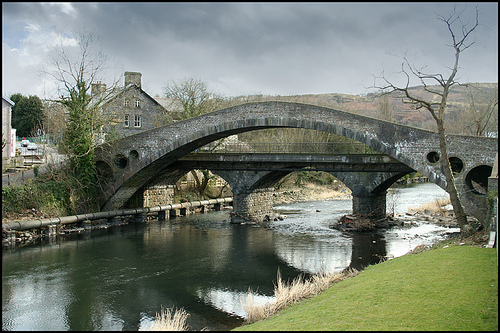 The town was originally cited in this location due to the easy crossing of the River Taff, as it is at this point that the waters are at their shallowest. The name of the town itself is believed to be a derivative of the ‘Bridge of Earth’. The town lies at the confluence of the Rhondda and Taff Rivers, and it was the development of the canals and railways that brought early prosperity to the town, that and the fact that in 1790 the region was discovered to be rich in coal. As you wander around the town you will find that many of the older buildings have Victorian stone facades, constructed from intricately decorated local stone. The town is more famous though for its oldest bridge, at the time of its construction it was the longest bridge of its kind in the world. So challenging was the construction of this 45 meter long bridge that it took three attempts to get the design right. Bridge one was constructed from wood and washed away, the second, a stone bridge collapsed under its own weight but the third, although also made using stone embodied a unique triple hole design and still stands today. The heart of the town is undergoing something of a redevelopment process, and although this is still very much still the gateway to the valleys it is now subject to traffic management. Many of the old factories have gone to be replaced with modern supermarkets and shopping centres. The rail station here was once famous for having the world’s longest platform, though has since lost the record to some more modern station builds. Once all of the redevelopment has been completed it is hoped that the town can apply for, and be granted city status. The river that flows through the town is no longer filled with the detritus of the coal mining industry and now has cleaner waters and a thriving salmon and trout population, as well as a growing community of riverbank otters, and alongside the river bank you can follow the Taff Trail, a cycle route which runs from Brecon through to Cardiff and allows you to take in some of the best sights and natural landscapes to be found in the area. Of course Pontypridd has some famous sons to be proud of too with legendary singer Tom Jones, sportsman Neil Jenkins and musician Chris Slade all having their roots in this welsh town.